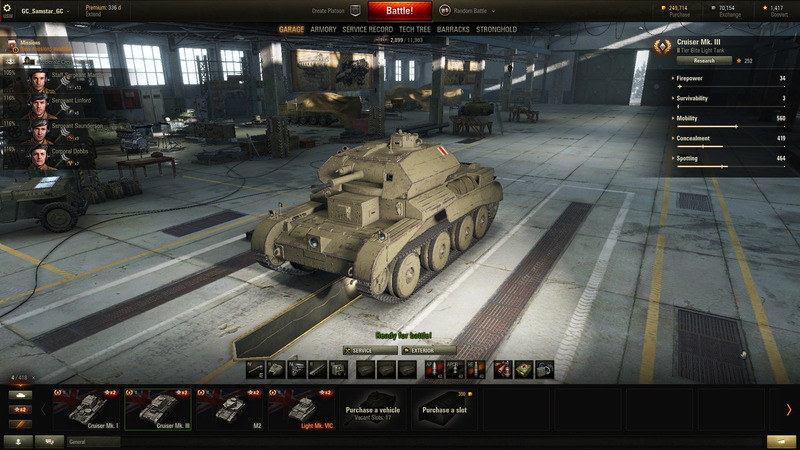 This guide will help you decide what tank to buy first in World of Tanks. For a new player, it can be difficult to decide which tank you should buy first, especially when you’re looking down a tank line like the German tank line and seeing the hundreds of options in front of you. We’ve done the research to help you decide which tank you should spend your hard earned Experience and Silver on. Read on to learn which tank to buy first in World of Tanks. Each tank type has its own playstyle, be it scouting, aggression, support, or something in between, and figuring out which one you like best can be tough. Light tanks focus heavily on rapid movement and positioning yourself to scout out an area for some of the heavy hitting tanks. Medium tanks are a mixture of speed and damage, and a good middle ground for players who want to be an all-rounder. Heavy tanks specialize in lots of armor and high damage, but suffer from slow reload speeds. Tank destroyers have extremely high damage, enough to one-shot an enemy tank but are extremely fragile. 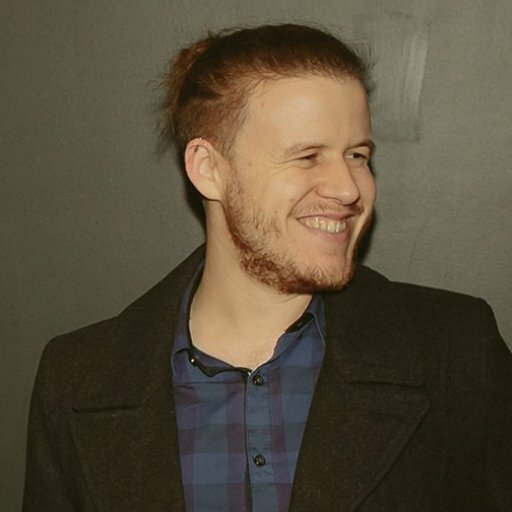 Finally, SPGs or Artillery are tanks that have a completely different firing solution which changes the perspective to a birds-eye-view and are usually found sitting at the very limits of the map. As you begin your World of Tanks career you will receive a mission called “New Research”, tasking you with researching and purchasing any Tier 2 vehicle. While you can pick any tank, you will likely want to invest in something worth playing and keeping. There are over 30 tanks to choose from in Tier 2, so we’ve narrowed it down to four tanks, one from four of the tank-types, excluding Heavy, as Heavy’s aren’t available until Tier 4. Remember that your first tank purchase can only be within the same Nation that you have played before. This is because whenever you play a tank, you earn experience on that tank which you can use to purchase the next tank along. As an example, if you've only played the British Vickers Medium Mk I, you're not going to be able to purchase the SU-18 from the USSR line as you would have no Experience in that Nation with which to buy the SU-18. For a more detailed explanation of how experience works, be sure to read our guide on how experience works in World of Tanks. Players looking to buy a fast tank for their first purchase can do much worse than the Cruiser Mk 3. It offers high speeds and great gun depression, as well as an appealing British tank line. The Cruiser Mk III is a UK Light Tank that costs 220 Experience to Research and 3,800 Silver to Purchase. The Cruiser Mk III boasts a good power-to-weight ratio meaning it can offer higher speeds when compared to other tanks of a similar power. Though it turns poorly at higher speeds, it is able to reach top speeds rather quickly. Use hills and cliffs to your advantage as the Cruiser Mk III has one of the best gun depressions in the game. As for equipment, you have the option of using either the Ordinance QF 2-Pounder Mark IX which allows for an excellent mix of accuracy, penetration and damage, or the Pom-Pom, a four-shot machine gun that will shred through any target that gets too close. For a new player deciding what tank to buy first, the T2 Medium Tank is a decent all-rounder vehicle that leads down some exciting USA tank lines. 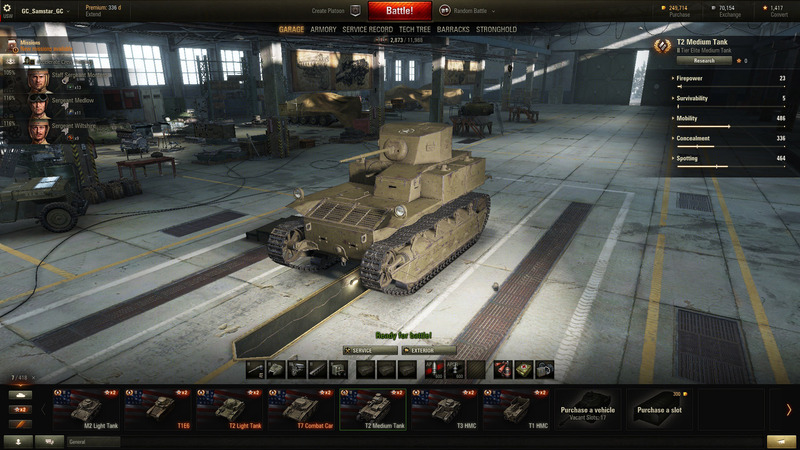 The T2 Medium Tank is a USA Medium Tank that costs 280 Experience to Research and 3,500 Silver to Purchase. Due to the relatively thin armor on this tank, it is advised that you peak-and-fire so you do not leave yourself overly exposed. Despite this, the armor offers some decent protection against automatic guns which should help you survive encounters if taken by surprise. The T2 Medium also leads to the M4 Sherman, a tank known the world over for its actions in major conflicts. There's no need to stop there, because further down this USA tank line is a popular fork in the road, resulting in the Pattons or the T29 Heavy, both options being enjoyable to play. As far as which tank to buy first, the Panzerjager 1 offers new players an insight to the raw power and accuracy of German tanks. The Panzerjager I (Pz Jag. I) is a German Tank Destroyer that costs 275 Experience to Research and 3,200 Silver to Purchase. The Panzerjager I is an excellent introduction to the Tank Destroyer class and should be seen as a learning experience for some of the higher-tier TDs. It offers good accuracy, rate of fire, view range, and damage, especially when using the 4.7 cm Pak (t) L/43 gun module. To increase your chances of survival you should consider purchasing a Camouflage Net as this will allow you to see targets before they see you. The Panzerjager is also the first TD available down a popular German tank line that leads to the Waffentrager auf Pz. IV. The SU-18 is an excellent first-timer's SPG and definitely a tank worth purchasing first. It is highly accurate and deals plenty of damage. You'll get a lot of bang for your buck. The SU-18 is a USSR SPG that costs 270 Experience to Research and 3,550 Silver to Purchase and is comparable to the British Loyd GC. The SU-18 has decent range for its rate of fire along with a faster shell travel time, meaning you will be able to line up, fire shots, and see them hit their mark sooner than other Tier 2 SPGs. It’s also small, allowing you to easily hide in small shrubs and bushes. 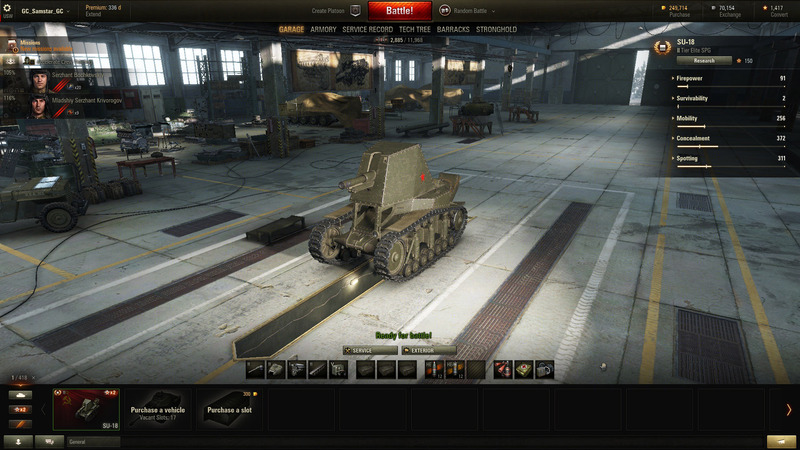 The SU-18 also has a good elevation arc, meaning you’ll be able to shoot over taller obstacles than other SPGs. Keep in mind that SPGs are an extremely different play-style to other tanks types. Any new players to World of Tanks are initially going to be overwhelmed with the amount of information available to them, especially when it comes to which tank to buy first. Hopefully, if you’ve just started your World of Tanks career, you’ve found this guide useful in selecting your first tank to buy. If you bought a tank that’s not on this list, let us know in the comments which tank it was and why you bought it first!